Botox® is the first and only Health Canada approved prescription medicine for treating chronic migraine headaches. Scientific studies and our experience confirm that Botox® injections relieve both the frequency and severity of chronic migraine headaches. Botox® injections are used to prevent headaches in adults (18 or older) with chronic migraines that occur more than 15 days a month, lasting 4 hours or more. On average, Botox prevents eight to nine headache and migraine days a month. Headache, Migraine & Concussion Centre offers Botox® to treat chronic migraine headaches, a prescription medication approved for this purpose by Health Canada. Botox® has been approved for medical use since 2012. If you are older than age 18 and have migraine headaches that last at least 4 hours on at least 15 days each month—defined as chronic migraine—you could benefit from preventive Botox® treatment that reduces the frequency and severity of headaches. Botox injections include a toxin derived from the Clostridium botulinum bacteria that temporarily paralyzes the muscles. It works by blocking the nerve signals. While Botox® has traditionally been used for cosmetic purposes, such as smoothing the appearance of fine lines and wrinkles, it also has several medical applications. Although this toxin is responsible for the severe form of food poisoning called botulism, it is safe for injectable use in small doses. This procedure is done in the office and takes the same amount of time as a regular doctor visit. For migraine treatment, the doctor will administer 31 Botox® injections in 7 targeted areas of the head and neck muscles, including the nose, nose bridge, forehead, temples, the back of the head, and the neck and upper back. These locations are the sites of the nerves that cause headache pain. Botox® enters the nerves and blocks pain signals from activation. The injection is relatively painless. Some patients describe the sensation as tiny pinpricks. If necessary, topical anesthesia can be used at the injection site before Botox® is administered. What Conditions Are Associated With Botox® Injections? 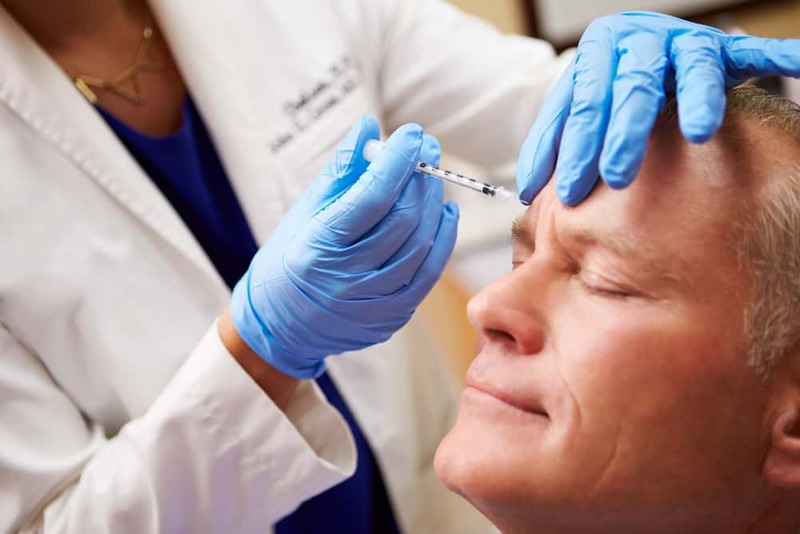 Botox® injections can be used to treat chronic migraine headaches, neck spasms (cervical dystonia), overactive bladder, excessive sweating, uncontrollable blinking, and lazy eye. We offer Botox® treatments to our patients who experience chronic migraines. While migraines affect about 12 percent of the population, only one percent of the population develops chronic migraines. This is defined as at least 15 headache days each month, at least eight of which include features specific to migraines, such as sensory sensitivities, nausea, or vomiting. According to research published in the journal Neurology, only about one in three migraine patients takes advantage of preventive treatments despite the efficacy of this type of therapy. How Effective Is Botox for Chronic Migraine Treatment? On average, Botox® injection therapy for migraines can eliminate up to 9 or more headache days each month. The results last up to 12 weeks before another round of treatment is required. The benefits of this treatment develop gradually, so some patients may not experience the optimal reduction in headaches until after 2 or 3 appointments. In a clinical trial published in Johns Hopkins Advanced Studies in Medicine, patients reported 50 percent fewer headaches after 2 treatments. However, many patients experience relief within 5 to 14 days. Botox® help decrease the severity of migraine symptoms such as pain, light and sound sensitivity, and nausea and vomiting. It can also reduce the number of headaches you experience each month. In most cases, Botox® can safely be used with your other headache medications, such as those taken to relieve pain or reduce symptoms at the onset of a headache. Preventive treatments can prevent headaches exacerbated by overuse of pain medication. Patients who have fewer than 15 headache days each month are not eligible for Botox® treatment. When performed by an experienced physician, Botox® injections are a safe way to treat chronic headaches. Side effects of treatment may include pain or swelling at the injection site and flu-like symptoms. These are rare, however, and most experts agree that this is a risk-free way to treat the pain of chronic migraines. Soreness after the procedure can be treated with an ice application to the affected area. If you experience chronic migraine headaches, contact Headache, Migraine & Concussion Centre for a consultation. Our doctors will develop a thorough treatment plan to help relieve your painful symptoms and improve quality of life.